It’s hard to believe that Brave, Bold and Bonkers was a week ago. 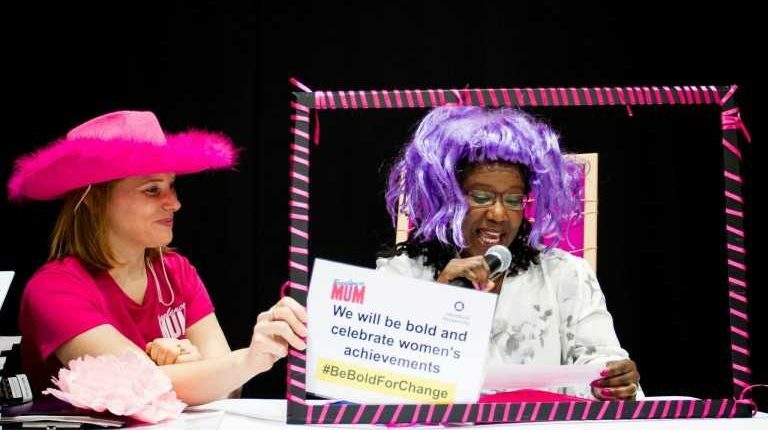 The annual Freelance Mum celebration of International Women’s Day (IWD) and showcase event, went with a bang! Every last minute of planning and preparation was worth it, to see the sense of unity and magic in the room, throughout the day. It was the third year of Brave, Bold and Bonkers and it’s grown increasingly bigger every year. A little feature added here, a tweak there – until this year we took to a new venue, in the form of the previous HTV Television Studio, now known as Bath Road Studios. Just changing the venue alone, gave it a sense of excitement – there’s something about holding a networking event in a broadcasting studio, which had an added twist. And from a personal point of view, felt like I was going 360 degrees, returning to the place I started out with HTV Drama Workshop at the age of 14. With it, of course, came a few constraints – with no kitchen facilities, catering needed to be brought in. 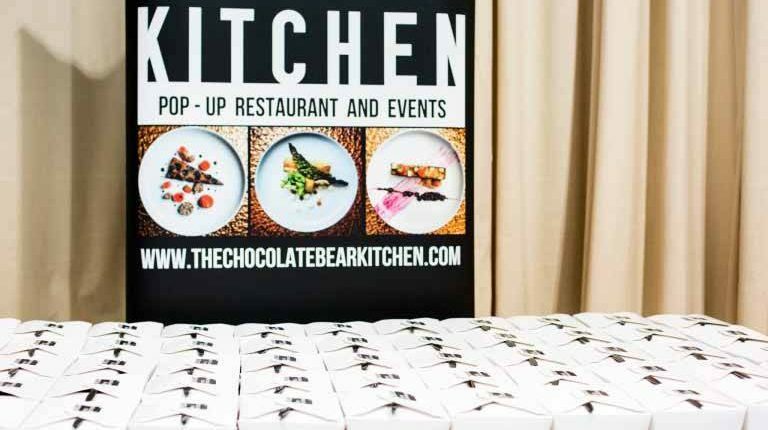 It was The Chocolate Bear Kitchen – a dab hand at pop up events, who rose to challenge of feeding 50 mums and children, keeping them fed and watered. And while HTV really was a bare studio and gave us a blank canvas to work with -it also required ‘dressing’ for the day. Fortunately, we were armed! With March 8th firmly in the diary every year, ideas had been bubbling for some time. Including, getting a piece of graffiti commissioned especially for the day, but freelance parents, Graft. 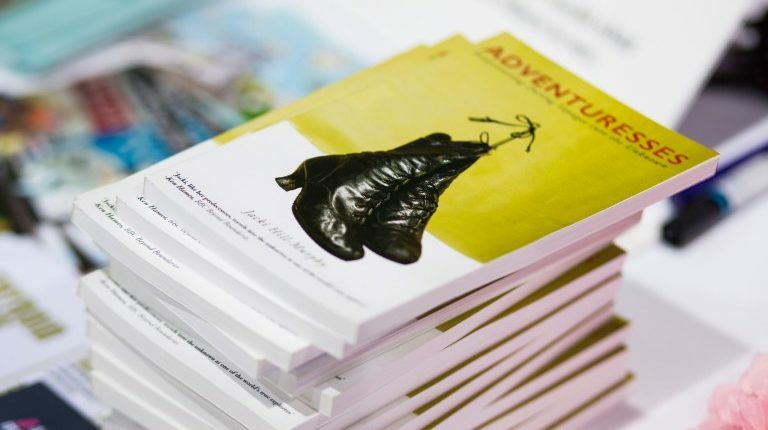 Between them they provided two pieces, which added colour and style to the venue – as well as reflecting the Freelance Mum values and Bristol vibe. And while the event was called Brave, Bold and Bonkers – it turned out to be Brave, Bonkers and Bold with a last minute change to the running order. Just what every event organiser needs! Though, like all these things – it very much worked out for the best. Three guest speakers, each one speaking on their given topic of Brave, Bold or Bonkers – and what it means to them in their chosen business. 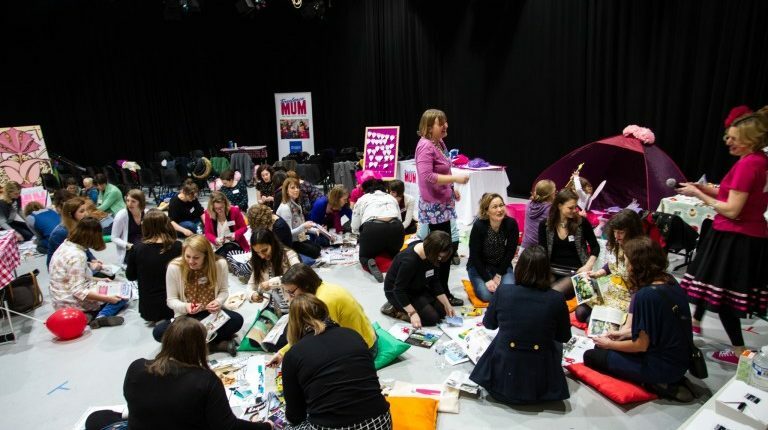 As the day began, every one was given Freelance Mum tote goody bags, stuffed with goodies from sponsors IPSE and Redmaids High School, plus all sorts of lovelies from fellow freelance mums. Not to mention, cut out paper hot air balloons – a key part of the day. Like all Freelance Mum events, the day began with an icebreaker – a chance to mix the group up and get chatting instantly. As the event was held in a Television Studio, it seemed only fitting for the theme to be headlines, with the group divided into 4 smaller groups and each given an envelope of real headlines. One brave, one bold and one bonkers (are you spotting a theme yet?) the task was to ditch one of the headlines, then write their own to read as a newsreader – complete with wig and glasses! The rest of us had to guess the fake headline. From there to the opening guest speaker – Brave, aka Adventuress, Jacki Hill-Murphy. I first met Jacki several years ago, when working at Radio Bristol. She stayed in my mind – with her incredible tales of retracing females explorers footsteps and film making/documenting their journeys. Well, it was hardly a tale that was going to blend into the background! From the off, Jacki’s story was brave – from making the decision to retrace the footsteps, to going out there and doing it, nothing has stopped her. Yet -like many inspirational speakers, modest with it. She brought her book with her to sign and a piranha fish – as every Brave guest speaker does. As Jacki reached the end of her talk, cbeebies Katy Ashworth casually walked into the studio, ready to begin her Bonkers talk. Every inch as lovely in real life as she on the television, Katy was totally at home at Freelance Mum. You almost had to pinch yourself to when you stopped and thought, it REALLY was a CBeebies presenter, joining us for the day. Well, I did anyway! Katy came on my radar, in a Freelance Mum way, a couple of years ago at the opening of a local Play Barn. She’d only given birth a week or so prior to the event and was juggling those early days of motherhood, with a personal appearance. I can remember looking at her and thinking ‘I get it, I know your bonkers world’. So when a mutual friend of mine, said I must introduce you, I jumped at the chance. In fact, I’ll never forget when we first spoke and I asked her if she’d like to speak as ‘Bonkers’. 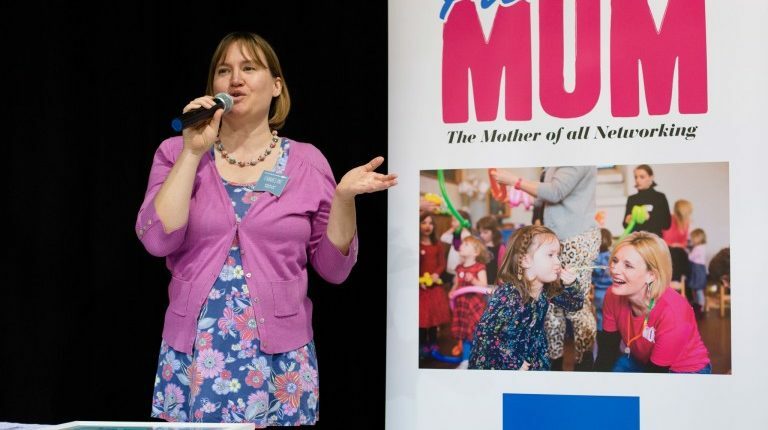 We both had goose bumps as Katy explained she has wanted to tell her story of life as a freelance single mum, for some time and just how bonkers it is, juggling the pains of one thing, while putting on a huge smile and entertaining children. 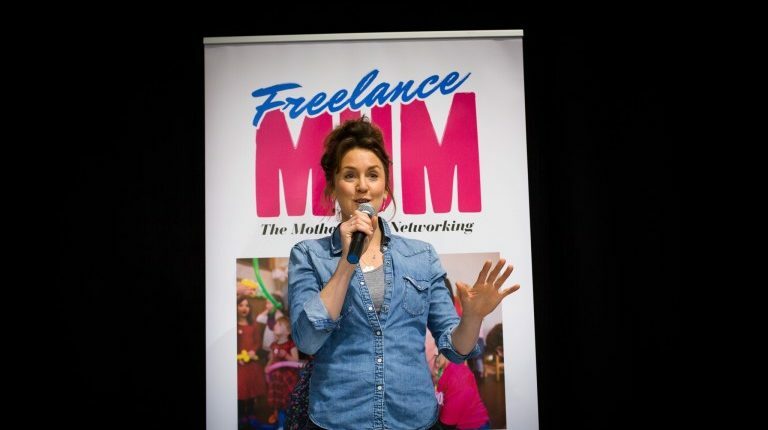 Freelance Mum seemed like the perfect place for that story, with Katy’s incredibly honest, comical and down to earth style – she wore her heart on her sleeve and had us both laughing and crying. She was amazing. 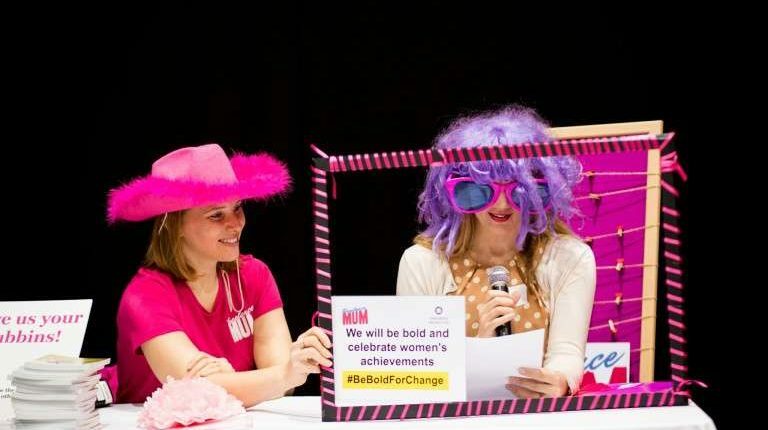 We were particularly blessed this year, as the IWD theme for the year was BeBoldForChange – echoing our own theme of Brave, Bold and Bonkers, it was easy to weave in. As Katy wrapped her talk, she held up her paper hot air balloon and wrote down her bold pledge ‘Create More Space’. Every one was asked to write down their bold pledge on their hot air balloon (we chose the hot air balloon, as something which can be seen from a great height and show the world your message. Also, in keeping with the Bold challenge, led by Artist Emmie Simpson). 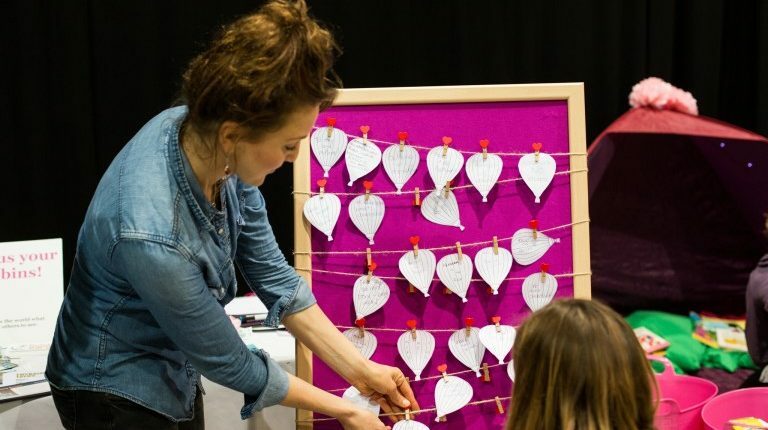 The pledges were then pegged to the pink noticeboard, for every one to see – ready for our secret surprise at the end of day. Now, in the interests of transparency, I was approached by Teacher Boards to blog about their rainbow board prior to the event. When I think of all the products I’ve been asked to blog about over the years, it might seem an unusual one to feature – but I could see it would get used. Not just at home, where it could hung on the wall – but also at outside events. 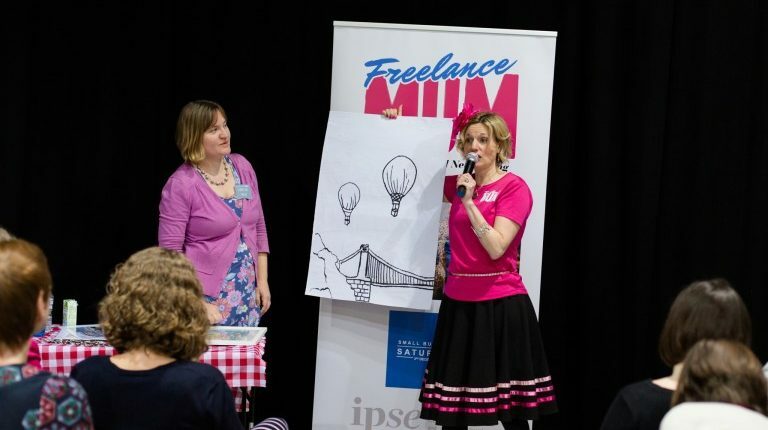 It seemed only fitting to use it at Brave, Bold and Bonkers – where the Freelance Mum trademark pink, stood bright for all to see and really lit up the studio. Not to mention, did a brilliant job of displaying a beautiful array of bold pledges. I was so pleased I was able to use as part of the event, every inch in keeping with the Freelance Mum impromptu style and fun way of approaching things. 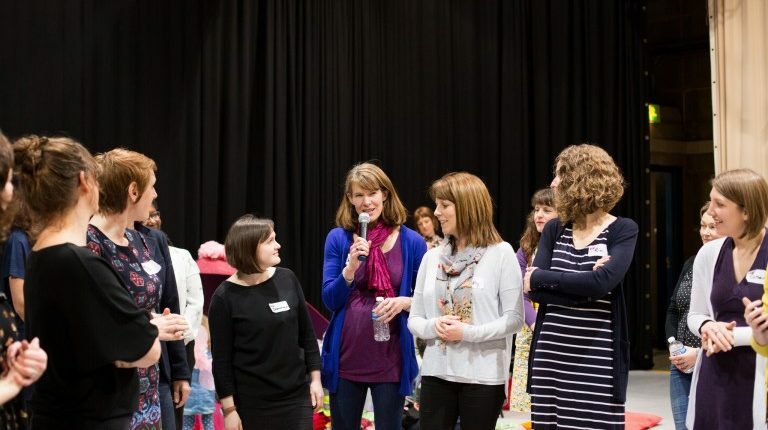 Any regular attendee of Freelance Mum, will know every meeting has a signature netwalk. It’s a key part of every minute. There’s something about fresh air, that gives fresh thinking. Not to mention, it’s a darn sight easier to talk with children in their pushchair or scooter! 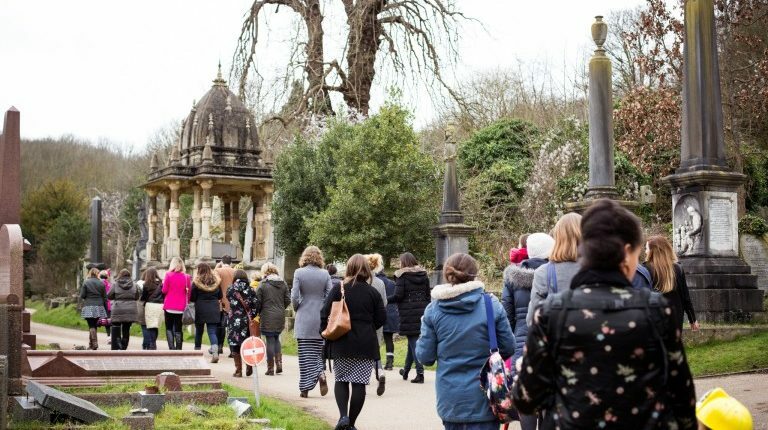 We were blessed with the setting, right next to Arnos Vale Cemetery – a beautiful setting. As usual, the walk was divided into three sections, with the opportunity to talk to a new ‘buddy’ at each section and be given a new focus question. A great way to get conversation started. And while we were netwalking, there was a whole team of people beavering away – resetting the studio, ready for Emma’s Bold workshop and turning the hot air balloon bold pledges into carefully handwritten bold key rings. An important keepsake and reminder of the day. Finally it was over to ‘Bold’ – aka, Artist Emmie Simpson. 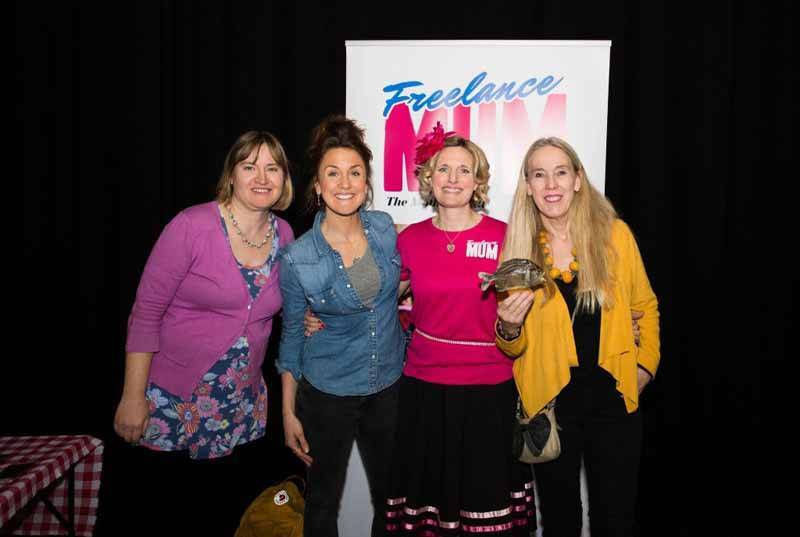 A familiar face at Freelance Mum and some who has really grown in the group. I can remember quite clearly chatting to Emmie for the first time, funnily enough on the netwalk – as we were passing the M-Shed. She told me she was an artist and that I might know her work – in fact, it was in the M-Shed. As I looked through the window and instantly recognised her pictures, I felt slightly star struck that I was actually talking to her! 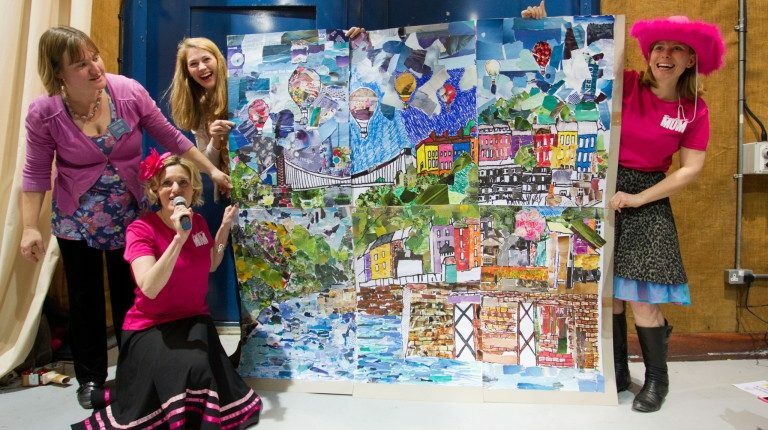 Three years on and Emmie came to the fore at Brave, Bold and Bonkers – concluding the day with a beautiful interactive giant colouring in of her work. It was the iconic balloons over Bristol image, which was blown up into 6 A1 sheets. In turn, the attendees were divided into 6 groups and had half an hour to colour in their section. No pressure then! Some chilled out music played in the background, while I surveyed the industriousness going on around me. 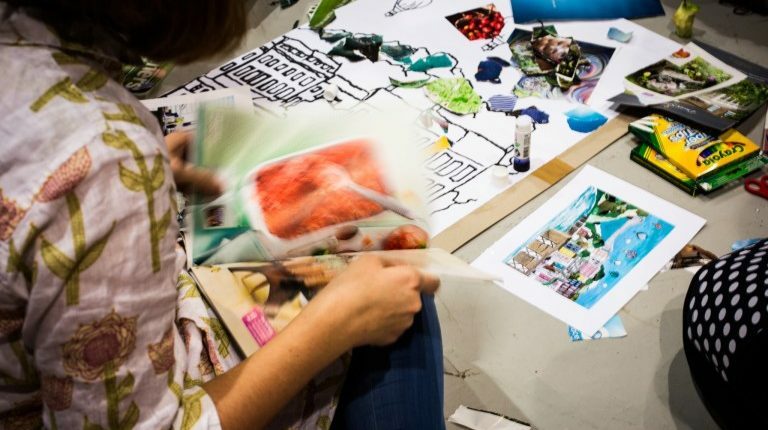 Groups of women, coming together, cutting out magazines, making collages, borrowing glue, chatting away – united together. It was an incredible moment. And as Emmie joined the pieces together, the microphone was passed around and for those who were happy to share their bold pledge, announced it to the group. 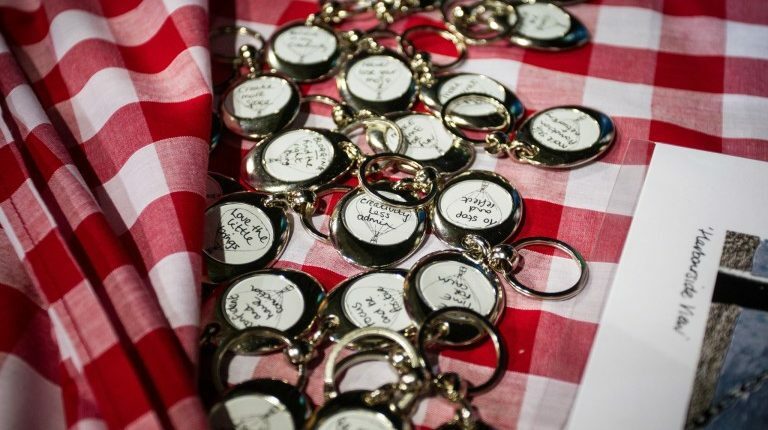 When the final person shared their pledge, I revealed the key ring keepsakes, their pledges had been turned into (which in true Freelance Mum style, Emmie had got her boys making, in ready preparation for the event!). The final moment of the day came, when the giant picture finally came together. I can’t tell you how nervous I was – waiting to see if it would stand up and actually work! It did – it really did work. The sense of unity in the room was amazing, for a group of people to see the fruits of their labour, many of whom hadn’t even met before. It felt like a fitting end to a perfect day. 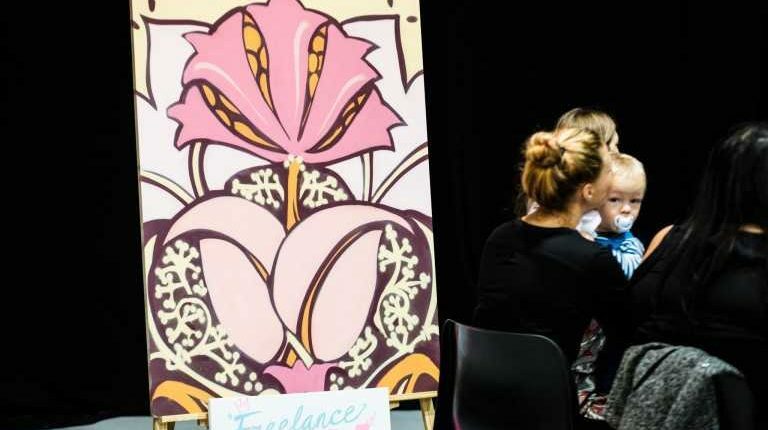 To me, Brave, Bold and Bonkers is the showcase event for Freelance Mum. As an organiser, it almost felt like organising my own wedding – the level of detail that went into the day. Yet much like a wedding, it was worth every minute and the love you could feel in room – wow, if only you could bottle that vibe. 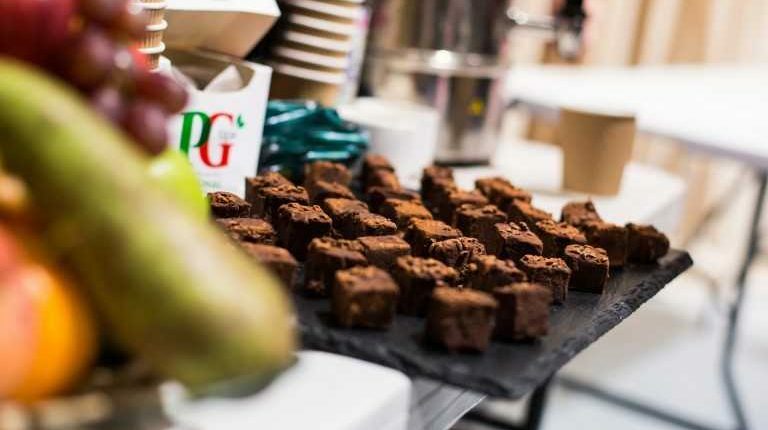 There is no denying, there were times in the run up, I felt I must be brave, bold and bonkers to organise such an event – but I wouldn’t have it any other way. 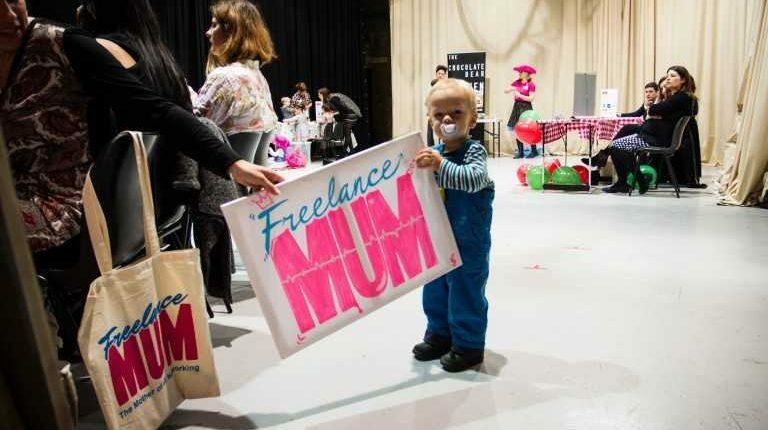 Such a celebration of freelance mums, coming together, in a supportive environment, is an incredible occasion. With huge thanks to every one who helped Brave, Bold and Bonkers go smoothly – from putting up the chairs, to helping with parking duty, stuffing goody bags and stamping key rings. I couldn’t have done it without you. To sponsors IPSE and Redmaids High School, for working together to support freelancers and the next generation. To Teacher Boards, for the beautiful board for our bold pledges. 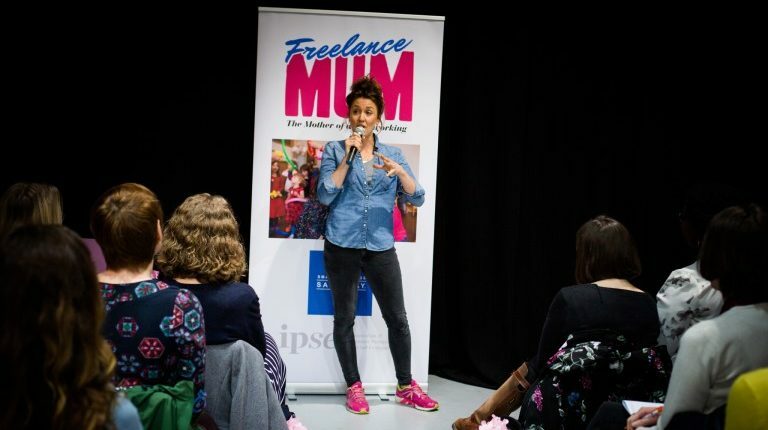 Special thanks to freelance mum, Nicola Jane, for providing these lovely photos of the day and every Freelance Mum events. 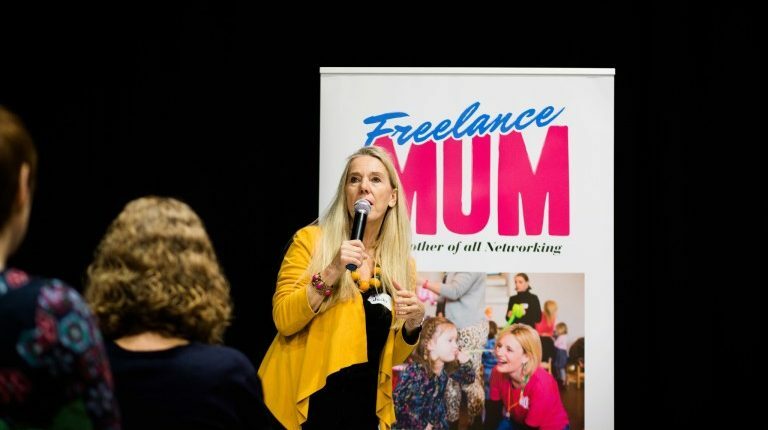 Freelance Mum is runs networking events, designed to allow parents in business to network AND bring their children.